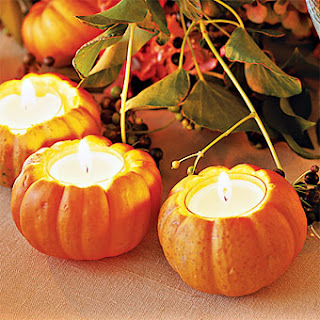 -small candles or container wax and pre-tabbed wicks. Fist cut the top of the pumpkins and empty the pumpkins of everything inside, it is important that the pumpkin is completely empty to prevent a fire hazard. Second poke two holes on the sides of the pumpkin, third put the ribbons though the hole and tie the ends of it. Make sure the ribbon is at least seven inches away from the flame. The last thing you need to do is put in your candle. You can pour wax in and put a wick in it or you can use store bought candles that can fit in the pumpkins.